The residential real estate market appears to have been one of the few encouraging areas within the U.S. economy during the 2nd quarter. While we observed many positive reports with respect to existing home sale prices, pending home sales, inventory and initial building permits, we still believe that it will take several years for the housing market to fully recover and work through the entire excess inventory that remains in the system. It is also very likely that pre-recession housing values may indeed prove to be the peak for many areas of the country for years to come. Regardless, the next leg of this economic recovery cycle may very well be led by the housing market. Three statistics that we generally review when we assess the housing market are existing single-family home sales and prices, inventory and months of excess supply as well as pending home sales. A review of these three data points, as provided by the National Association of Realtors® as of June 2012, shows that sales have increased from 1 year ago virtually in every region across the United States for existing single family home sales transactions over $100,000. Inventory levels fell by 3.2% in June while the months of excess supply have fallen by nearly 26% over the past year. While there remains over 6 months of excess supply in the system, the trend that has been developing over the past year is positive. 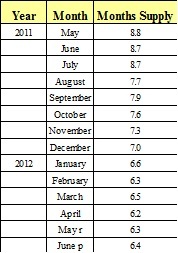 Source: National Association of Realtors, June 2012 – Seasonally adjusted supply/seasonally adjusted sales. While prior increases in sales activity were associated with a drop in prices, recent sales data seems to support stabilization in home prices, and even slight price increases in certain regions of the country on a year-over-year basis (Ex. Midwest and West). Across the U.S., the sales prices of existing homes have increased by nearly 8%. 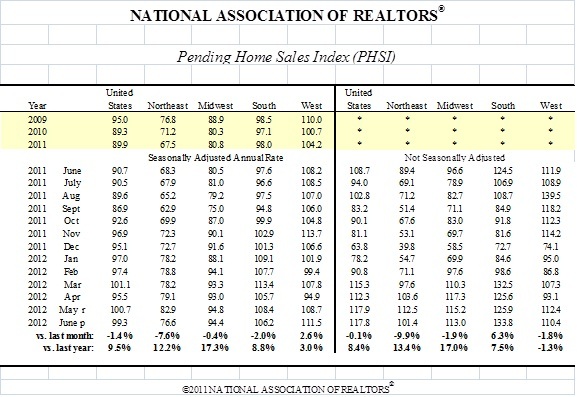 Continuing on a recent positive trend, as of June 2012, pending home sales in the U.S., on average, increased by 9.5% (seasonally adjusted) and 8.4% (not seasonally adjusted) respectively on a year-over-year basis with increases experienced across all four regions, with the slight exception of the West on a seasonally adjusted annual rate basis, of the country. Lawrence Yun, chief economist at the National Association of Realtors said in a June 27, 2012 release that, “The housing market is clearly superior this year compared with the past four years. The latest increase in home contract signings marks 13 consecutive months of year-over-year gains.” This adds credence to our belief that brighter days lie ahead for the housing market in 2012, and our overall attraction to the Real Estate Investment Trust (REIT) asset class, as pending home sales are often viewed as a leading indicator of residential real estate activity. An improving housing market is critical for consumer confidence, and the economic recovery overall, as home equity still accounts for over 16% of household net worth according to Federal Reserve data as of the end of the second quarter of 2010.